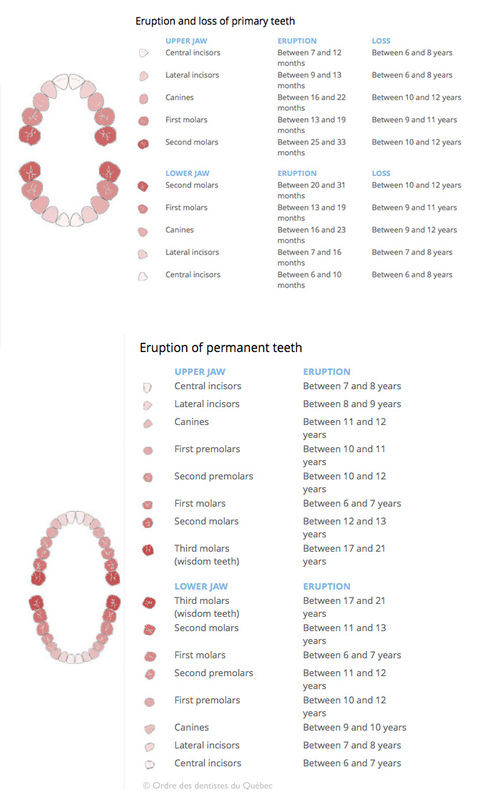 The video on the opposite side shows in fast-forward a normal eruption sequence of 32 teeth in humans. The numbers at the bottom represent the eruption age in years. The incisors are the first teeth to come out in children. The ones in the lower jaw appear between 6 to 10 months of age, and those in the upper jaw, between 7 and 12 months of age. The following tables represent the average age of tooth eruption. To learn more on normal dental eruption and anomalies that can be associated with it. To learn more on tooth anatomy and types and functions of teeth. It can happen, Dental eruption is not an exact science! Ask your general dentist to evaluate your child’s dentition to know it everything is normal.